There has been much debate about mental health law reform and mental capacity legislation in recent years with the UN Convention on the Rights of Persons with Disabilities also having a major impact on thinking about the issue. This edited volume explores the concept of ‘coercive care’ in relation to individuals such as those with severe mental illnesses, those with intellectual and cognitive disabilities and those with substance use problems. With a focus on choice and capacity the book explores the impact of and challenges posed by the provision of care in an involuntary environment. The contributors to the book look at mental health, capacity and vulnerable adult’s care as well as the law related to those areas. 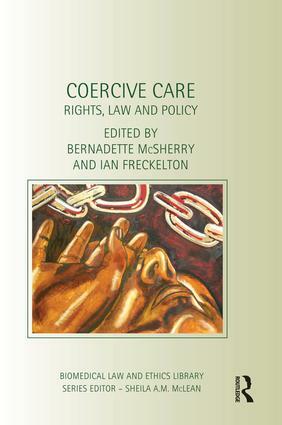 The book is split into four parts which cover: human rights and coercive care; legal capacity and coercive care; the legal coordination of coercive care and coercive care and individuals with cognitive impairments. The book covers new ground by exploring issues arising from the coercion of persons with various disabilities and vulnerabilities, helping to illustrate how the capacity to provide consent to treatment and care is impaired by reason of their condition. Bernadette McSherry is the Australian Research Council Federation Fellow and Director, Centre for the Advancement of Law and Mental Health at Monash University, Australia. Ian Freckelton SC, is a Barrister at Crockett Chambers, Melbourne, Australia. He is also a Professor in the Law Faculty and Department of Psychiatry, University of Melbourne and Adjunct Professor of Law, Monash University, Australia. Scientific and clinical advances, social and political developments and the impact of healthcare on our lives raise profound ethical and legal questions. Medical law and ethics have become central to our understanding of these problems, and are important tools for the analysis and resolution of problems – real or imagined. In this series, scholars at the forefront of biomedical law and ethics will contribute to the debates in this area, with accessible, thought-provoking, and sometimes controversial ideas. Each book in the series will develop an independent hypothesis and argue cogently for a particular position. One of the major contributions of this series is the extent to which both law and ethics are utilised in the content of the books, and the shape of the series itself.